Here it is, guys. The structure is 2.4 Angstrom resolution, which is not too bad for a start. 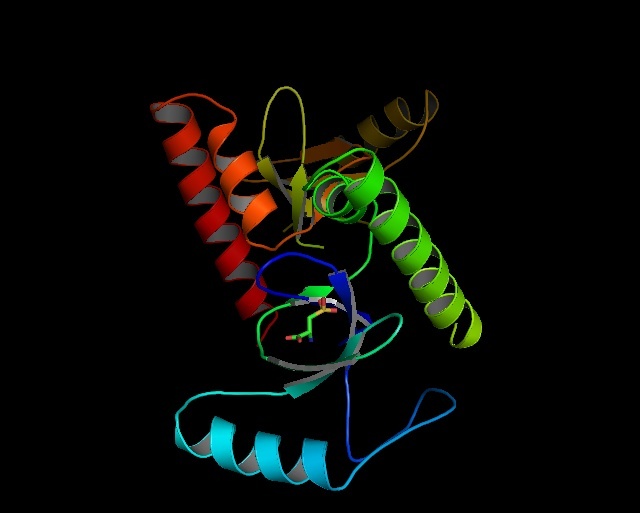 This happens to be a PWWP domain that recognizes methylated lysine containing peptides. The goal now is to design ligands on the basis of the small molecule fragment (you can see it) that has co-crystallized. I was talking to my PhD student Rebecca the other day and she is very keen to tackle this problem. 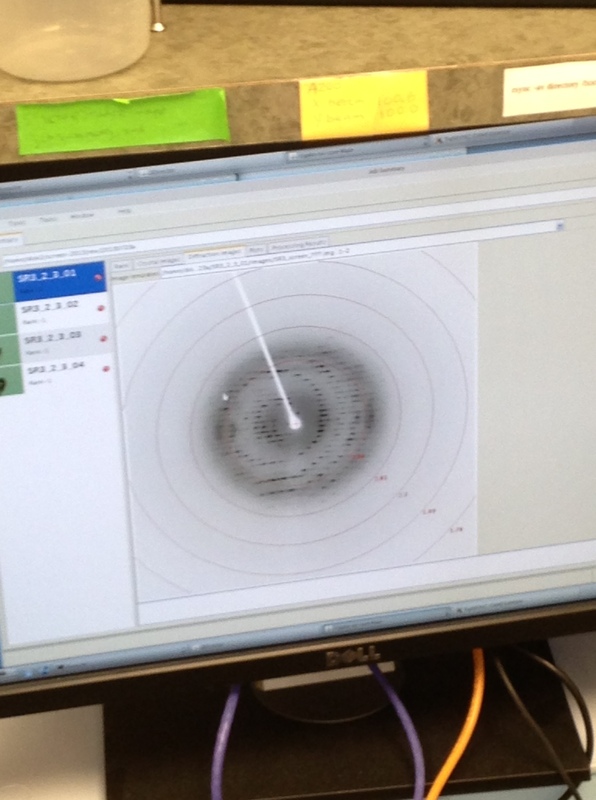 Today I learned that another crystal might be sent out to the synchrotron soon. That will be awesome. Big-time thanks to Elena (who teaches me protein crystallography) and to Aiping Dong, who is the crystallography expert. He is amazing. I love chasing proteins! I flew into Boston last night to give a talk at Novartis. I had a great time there today. Donovan Chin (Senior Investigator at the NIBR) was my host. I had a lot of fun hearing about their interests in molecules that are also dear to our hearts. I am talking about peptide macrocycles. Scott Lokey of the UCSC was also here at Novartis last week. Scott is doing some trailblazing work trying to understand the cell permeability of cyclic peptides. It is clear that the industry appetite to macrocycles is high, particularly with regard to gauging their complex stereochemical preferences… It is eye-opening to talk to people in industry who do this for a living. When I hear that docking a small molecule takes a couple of minutes (I refer to computational docking into a binding site of a protein target), whereas the same process for a macrocycle is close to 18 hours, I really wonder how anyone will get the “heavy lifting” (to use the language of Dr. Andrew Roughton, the COO of Encycle Therapeutics, a company I founded in 2012) done in this space. It is, nonetheless, a fascinating problem and we are going to deal with it heads-on as a community. Naively, I asked Donovan about why does it really matter to be “right” in a complicated maze of conformations that are differentiated by a fraction of a kcal/mol. However, it is important to keep in mind that this thing is additive… To use Donovan’s analogy, it is like walking in the streets of Paris (or any other city with a complex web of streets): one wrong turn and your mistake is exacerbated such that the “real destination” will never be found… If we have a cycle that is composed of (say) 8 amino acids – once you add all the rotors, it is easy to see that this is a tough problem to crack computationally. We needed to have some beers at the end of this day and went to this place called “Catalyst” right next to MIT. My former student Tim Rasmusson, who works at Novartis, came out – it was cool to see him! He is doing great. I hoped Ben Rotstein and Zhi He might join us (former PhD students who are now doing their PDFs at Harvard and MIT, respectively), but they were busy. I am at the airport now and will blog about my protein crystals tomorrow. The data is in! So… I have a ton of work this weekend and it is mainly about making constructs for our next protein expression experiments. I gotta tell you: this is opening my eyes to entirely new challenges. See, I have been trained as a synthetic organic chemist, which means (more or less) that we think how to forge COVALENT bonds between atoms. Seriously, this is what we do in synthesis (in rough terms). Typically, good things that are new and interesting come from irreversible connections between atoms (in a way protein expression is still synthesis, but you think on a different level that does not involve worrying about how the bonds are constructed). I now must admit that there are really interesting challenges out there I have not considered seriously until now. The biggest difference from what I have been trained to do is that covalent bonds do not drive progress anymore. For example, this weekend I need to think of constructs for several receptor proteins that we will hopefully be able to express in E. coli. This is a different ball game altogether and it has its own unique challenges. 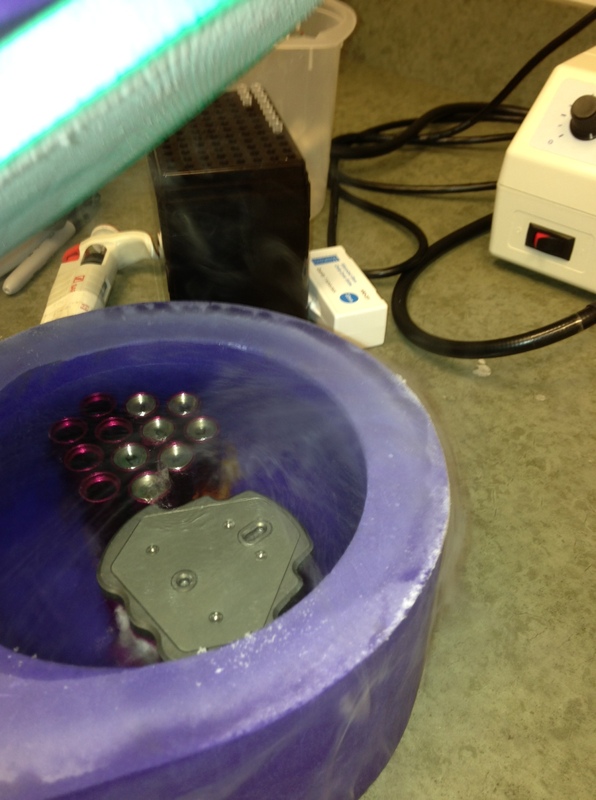 Not only do we want to make clones but we also want to make sure we will be able to express the proteins. The ultimate goals are varied and range from crystallization to the production of antibodies. However, I catch myself thinking that: a. I am excited about what I do; b. it is new to me and c. whatever I do is NOT about carefully orchestrating covalent bond making. This latter point is important because I have never thought that I would be interested in science that does not, ultimately, result in making new bonds. But here I am – making constructs for expression and I do not think about gluing things together. Kind of different and really interesting! There are no protein reports today… I am waiting to hear on the news from the synchrotron (tomorrow). For a change, today I am going back to MUCH smaller molecules. I was thinking if I can come up with an interesting question involving some really well known reagents that seem almost too trivial. The venerable borohydride came to mind! Take a look at the equilibrium shown below. This process can be driven to the right, offering a means to make borodeuteride. The finding comes from a rather old paper (I can post it in the future). I did not balance the equation and decided to just leave the bare bones of the central idea. What do you think is the mechanism of this exchange process? I now work with Elena Dobrovetsky. She is awesome. I am learning a ton about protein crystallography, all the way from expression to mounting of crystals and data collection. I will be posting my progress reports. 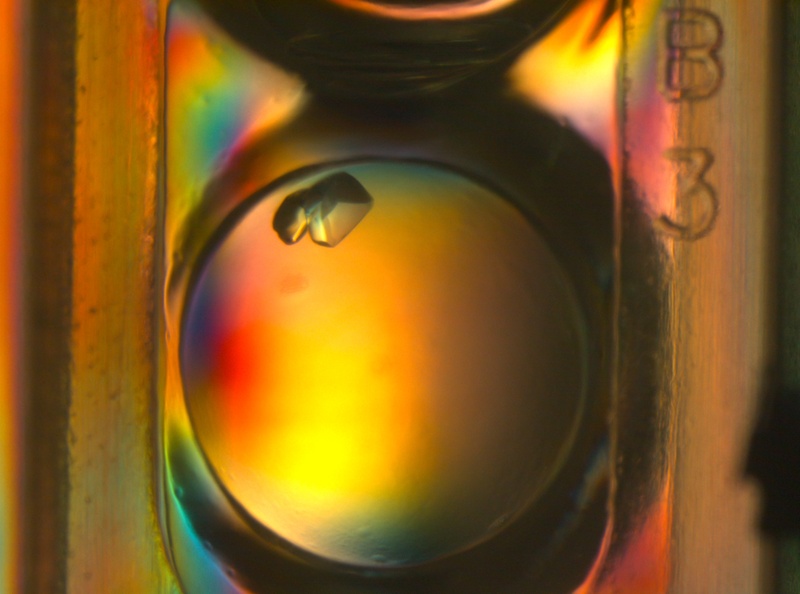 Just 2 weeks ago we set up 960 crystallizations of some epigenetic domains (more on that later) and got some really nice crystals already (actually only one condition delivered – attrition was high). My ultimate goal is fragment based screening using crystallography. This stuff is a ton of fun. I can hardly be found at my main office (Lash Miller Building), but I am fine with that – if you do a sabbatical, you may as well try to see that there really is a separation from your regular job. I asked my wife “Do you think my students miss me?” and she said “Ha ha ha! No way!!”. I suppose this is true… I am not sad though!